(Sorry for the bad coloring here... for some reason I had a difficult time taking screen shots last night.) 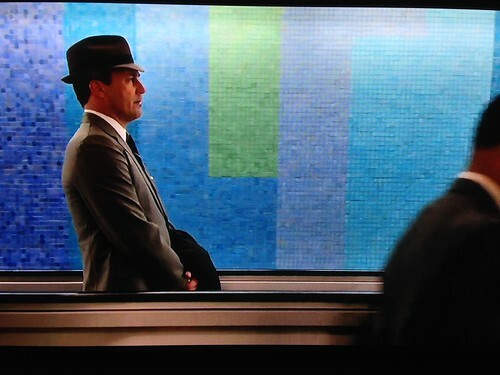 Above and below, Megan Draper (Jessica Pare) picks up her hubby Don at the Trans World Airlines terminal at LAX. 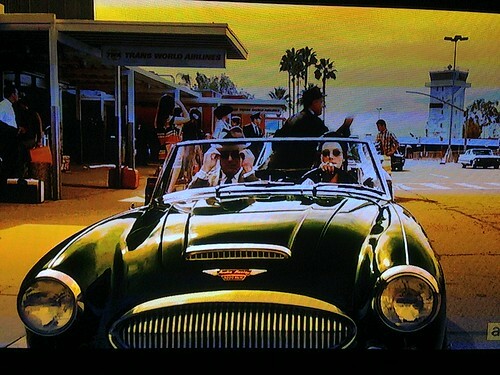 Here's a pull back shot of LAX from the episode. 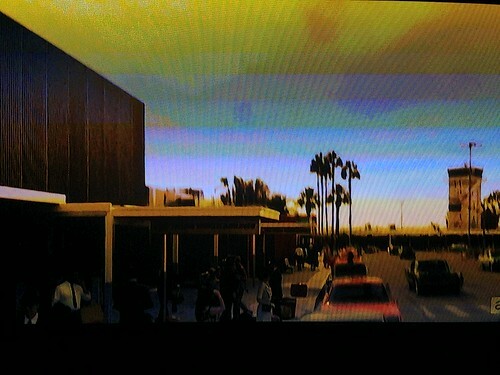 BUT wait a sec... that's not LAX at all! 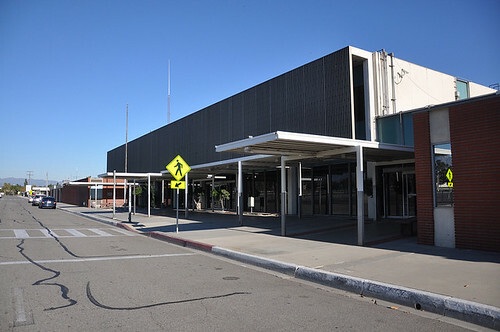 It's actually the old terminal at Ontario International Airport. 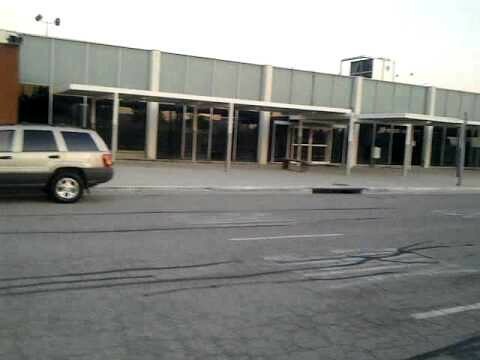 Yep, although the shot of Don on the people mover was indeed filmed at LAX, the outdoor scene between Megan and Don was filmed many miles away in Ontario. Above and below, here's Terminal One now, which is used for offices and storage. 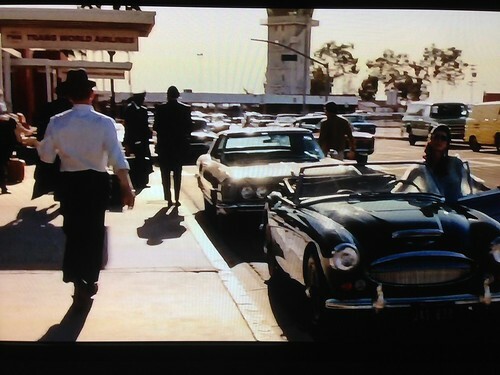 Film shoots at the Ontario airport are also a regular sight -- "Argo" filmed its airport scenes here. 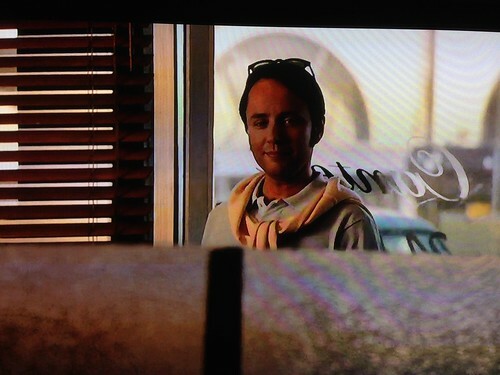 Above and below, Don and Megan meet Megan's new Los Angeles agent at a fancy restaurant. It's never revealed where they're supposed to be. Maybe Scandia? Chasen's? 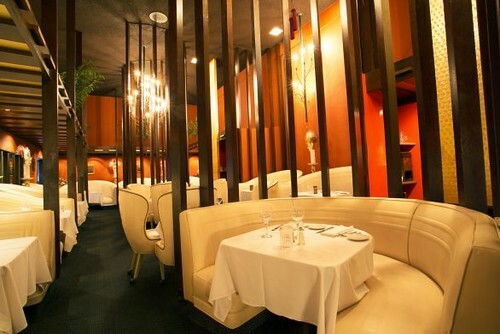 In real life, the scene was shot at the infamous Dresden Room on Los Feliz, made famous by "Swingers" and still the home of Marty and Elayne! 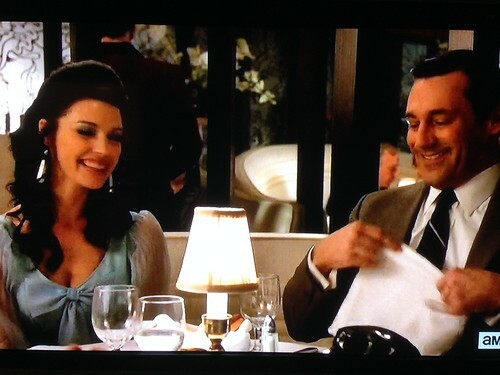 The Dresden has been around since 1954, so maybe that indeed is where Megan and Don were dining. 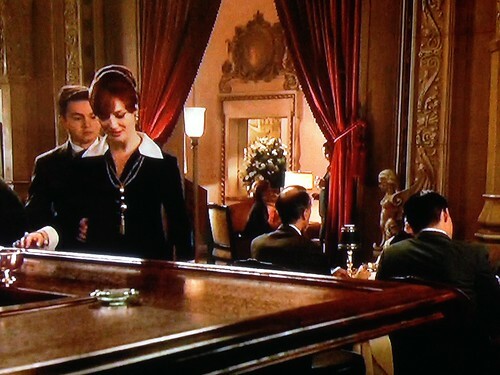 Above and below, Joan (Christina Hendricks) meets Wayne Barnes (Dan Byrd) for drinks at a New York restaurant. 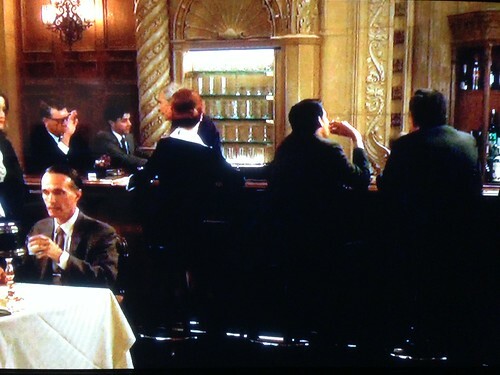 Of course, most Angelenos could spot that it actually was the Biltmore Hotel's Gallery Bar (below). 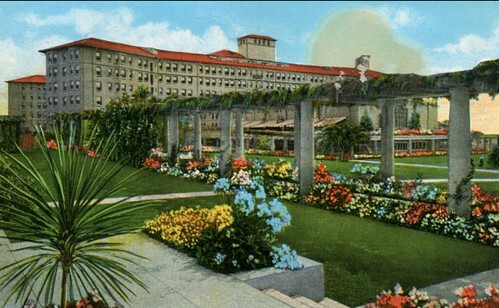 "Few bars in Los Angeles enjoy the fame of the Biltmore's Gallery Bar," the hotel proudly states. California Pete hits the famous Canter's on Fairfax. 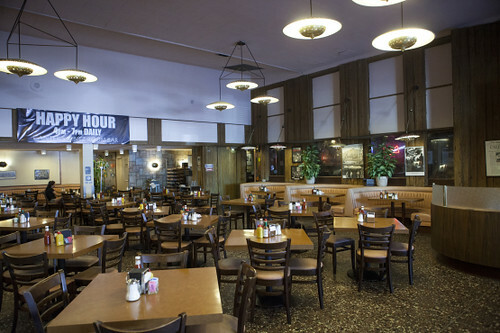 Not much needed to be changed on this Canter's shoot; as seen below, the restaurant still looks like it's from a bygone era. I'm bummed a young Rodney Bingenheimer didn't walk by. 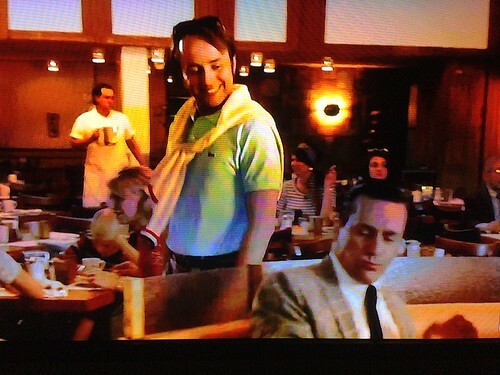 But other than that, a stellar week one for L.A. cameos in "Mad Men." Mike: That's some terrific insight and detective work. Looking forward to seeing more of this in the upcoming weeks!